In a small bowl, dissolve the yeast in 1/2 cup of water. Allow to sit about 10 minutes. Then combine yeast with 1 cup of flour in the bowl of a stand mixer with a dough hook. Mix thoroughly then add the 2 tablespoons of olive oil, salt, 2 1/2 cups flour and 3/4 cup water. Mix thoroughly again and then add the remaining flour and water. Continue to mix with the dough hook until a soft dough forms. If it is sticky, add a bit more flour, too dry or powdery, add a touch more water. Remove from the bowl and pat into a round shape. Grease a 14 x18 inch pan* with about 2 tablespoons of olive oil. Place the dough in it, cover with a damp towel and allow to rise** about 1 1/2 hours. After the 1 1/2 hours, stretch the dough out to the length of the pan, cover with a damp towel and allow to rise an additional 45 minutes. After about 15 minutes, preheat the oven to 450***. After the 45 minutes, uncover and poke the dough with your finger to make little holes. In a small bowl combine 1/4 cup olive oil,a tablespoons of water, rosemary and a bit of salt. Brush this over the bread along with the artichokes, and olives. Bake 15-20 minutes, checking about half way through to make sure it isn't browning too quickly. If you are using the Parmesan, sprinkle it on after about 15 minutes of baking then return it to the oven for about 5 more minutes. Serve warm or at room temperature. 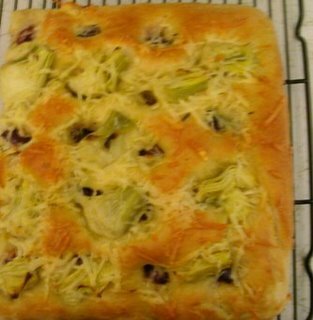 Focaccia is one of my favorite breads. I am not a big bread or roll person but I love a soft bread with "stuff" on it. This is a really easy recipe to make if you have a stand mixer (if you don't you could follow the same instructions and using a food processor or knead the dough by hand) but it is time consuming waiting for the dough to rise. It's actually a good recipe to make if you are expecting guests, the hands on time is relatively short leaving you free to make other dishes or so some clean up during the rising time. People are always impressed with homemade bread.